Graduate of The Academy of Economics in Kraków in Accounting, where in 1995 wrote final paper “Analytical Review in Auditing”. Between 1995 and 2000 worked for Polish audit company. Between 1998 and 2003 shareholder of accounting company Rach-Fin s.c. Experience in audit financial statements of the biggest companies in Małopolska Region, including public companies. Experience in preparation of public offer prospectuses, financial statements, consolidated financial statements, advisory assignment and company valuation. Co-founder of AdAc, responsible for auditing the financial statements of several dozen companies each year. Working for medium-sized and small manufacturing enterprises including chemical plants, tobacco, meat and clothing producers. 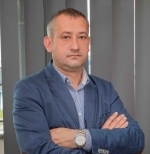 Jarosław Wdowiak is specialist in accounting structure architecture and new accounting systems implementations. In free time he loves every kind of football. He never misses any possibility of playing football. Now he promotes his teenage son, who plays as forward in junior team of Cracovia.